CBS: Colin Powell told graduates of South Carolina’s premier historically black university that they were graduating during a tumultuous time that saw a royal wedding, the beatification of a pope, and a U.S. military assault that killed Osama bin Laden, “the worst person on earth”. The stadium and its 400 graduates roared in appreciation of Powell’s comments on the president’s move last week to quell the doubts expressed by those who haven’t believed that he was born in Hawaii…..
Amen, Col. Powell. We know that our beloved President is an American and a darn good one at that!! vitaminlover–I am lovin the name. Happy Mothers Day DR, you rock :). I would love to have heard him defends and praise Obama. Also, it would be great to hear the students appreciating his comments. Thank you Colin Powell for standing with our President. This is way off topic , but does anyone know what’s going on with obamafoodorama? Is she changing her site? I sent her a tweet. The last time something like this happened, a few if us tweeted her and it was back up the next day. I just got a tweet back. She said the blog is offline today. It will be in “public” mode late tonight. Hi everybody. I am very happy that Colin is such a great role-model with the graduaters. You know Dorothy, I think the students read through the lines of appreciation that he has for Our President. Everyone have a great Mother’s Day even if you aren’t moms. I am sure you have been a mom to some child in your life by showing kindness to them. This is off topic but the only way I can reach out to everyone. Someone has messed with my computer so Chips if you are getting any crazy e-mails from me, I am not sending them. It is so messed up I got an e-mail from Chuck Todd and Jay Carney at the WH, from NZ, Australia, England, and other reporters that I dislike. I am not fooling. I think I fixed it but just in case. If Chuck Todd e-mails you, don’t open it. Barb, it is so nice to see you. As I remember, you lost a child and husband, right? You are so kind and sincere, I bet you were a great wife and mother. A big hug for you. Dorothy, I know you said your son is in NY and called you when Obama was there. It’s nice to keep intouch. He sounds like a great son. Thank you for your kindness and to everyone here at TOD…….the best place our dear Chips gives us to keep on top of things and put our brains together for 2012. My donation is coming tomorrow Chips. Good nite all……as if you aren’t all sleeping by now. 🙂 Sending warm energies your way and praying that God blesses each and everyone of you. my eyes are bad so just ignore all my typos. I am not going to correct the errors with another message any more. I can only imagine how shocking that was. I hope your computer problems are fixed. Wow, that was unbelievable! Thanks for bringing us that video. that brought back so many memories!! Colin Powell and I may have our difference but I respect him as a intelligent black man and following his head and heart and voicing his support for Barack back in 2008. I wanted to share this Article on Irish Times…About our President’s mom…. Great article thanks for posting. I had declared I would not purchase any third party books pertaining to the Obamas but I think I will buy this one. When Dunham later told a younger Indonesian journalist with whom she had a long romance that her son was graduating from Harvard Law School, he said, “okay, so he wants to be president”. To his surprise, she burst into tears. Is that from the new book, kasai? Former SOS Powell is the only Republican I would even contemplate voting for after our dear POTUS Obama has completed his second term. I am also noting how same as they do with President Obama, MSM seems to have a problem giving this man his due title. Yes they fixed it in the second paragraph but I have noticed most MSM calls him Mr. or just Colin Powell yet they never miss a chance to say Governor Palin (frigging half term quitter) or President Bush (former potus (fail boat one) would do)imo. After the Twin Towers collapse, it was always so comforting when Colin Powell came on the TV to talk about it, reassure Americans, make sense out that attack. I remember wishing that he were our president — a calm fatherly figure at the helm. I’m still furious at the people who sent him out there with such a garbled message about Saddam having weapons of mass destruction, that he later had to walk back. It ruined the reputation of a truly moral man. Thank you AGAIN, General Collin Powell for having the President’s back. You are the Only Republican I can stand to listen to or respect. Period. Way to go Gen. Powell! 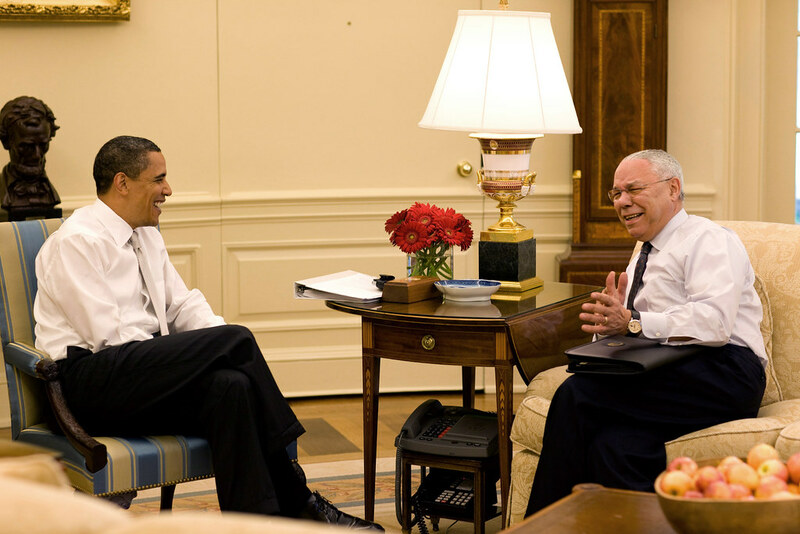 Chipsticks, Is that a recent picture of PBO and Gen. Powell? I think it was during the START treaty drama back in Dec. The former SOS came to visit POTUS and urged Congress to pass the START treaty asap. He is a good man and a great mentor to our POTUS. I’m so glad Gen. Powell said what he said about blowing away Trump and tha birthers. Because both of them needed to be blown away. The above picture gives the Impression, IMO, *BIG BROTHER, Little BROTHER*, Sitting, Chitting, Chatting and Chewing the Fat 🙂 It’s a nice Picture, I like It. Oh this is delightful news! I have always felt SOS Powell was crossed by the Bush administration. I did not blame him and I always felt sorry he was put in that position. Glad to hear he is taking a stand and being vocal about the birther garbage. I concur with you on this one M. I have a great respect for Gen. Powell. I hope he will also live to write several books about his relationship with this President. Also Kasai, I just received my copy of the book: “A Singular Woman;”, and it is great so far. I think it will be a great read. The writer took off from the NYT for 2 years to do the reserch for the book. From the looks of it, the book seem to be well documented. Enjoy. HZ send me the book when you’re done! 😉 I am joking and will just need to buy my own copy! HZ you are a complete joy! Thank you for spreading the love.